Check the different ways of Bajaj Allianz General Insurance Online payment. The policyholder can buy any policy through online using Bajaj Allianz Online Payment. Check Premium Online details of this company, to pay the premium through online. Bajaj Allianz provides various General Insurance policies like Health, Car, Home, Travel, etc. On this page, we also provided the procedure for checking the Bajaj Allianz Online Renewal process. The Bajaj Allianz General Insurance company is one of the leading general insurance in India. Bajaj Allianz General Insurance company has introduced the online payment services for the sake of customer convenience. This online payment is introduced because of two reasons. In the previous days, the policyholders have to visit the branch office to pay the premium, renewal, etc. It was a time taking process due to long queues and takes a lot of time. Also, in these days, people are so busy in their works and have no time to visit the branch office. Due to these two reasons, Bajaj Allianz General Insurance company provides the online payment services. By using these online services, the policyholder of Bajaj Allianz can save his/her time. Bajaj Allianz General Insurance company provides the online payment facility for the customers. Hence any Customer of this company can pay premium through Bajaj Allianz Online Payment service. Bajaj Allianz Premium Online Payment helps the policyholder to buy policies, make payment and renewal through online. The policyholder of the Bajaj Allianz company can pay the premium through the online payment option. By using the premium online services, you can pay the premium anywhere in the world and at any time since it offers the 24/7 services. For this purpose, the insured must have the login. Hence to access the online services, the policyholders must create the login for his policy. Here we are providing the login procedure for the registered candidates and new users and also how to premium payment, online renewal, online buying processes. Follow these procedures to save your time and to know about the Bajaj Allianz updates. Follow the below steps to buy the new policy and pay the premium payment. First of all, visit the official website of the Bajaj Allianz General Insurance Company. The official website is www.bajajallianz.com. Then the homepage of the Bajaj Allianz will open as shown in the below figure. Click on the General Insurance; a page will open as shown in the below image. The page shows the list of insurance plans on the top of the page offered by the Bajaj Allianz General Insurance company. Select any one of the plans according to your requirement. 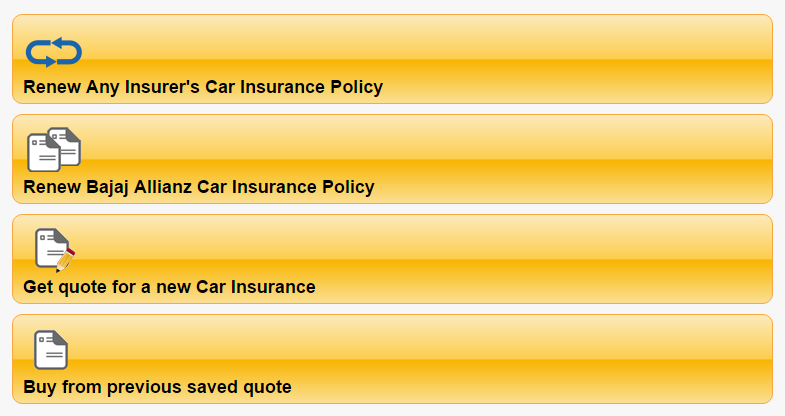 For example, choose the motor insurance by just clicking on the ‘Motor Insurance’ option. Select the any of the following Car Insurance, Two Wheeler Insurance or any other policy as shown above. And Click on Buy Now, a new policy will be open as shown in the below image. Select either ‘Get quote a new Insurance’ or ‘Buy from previous saved quote’. A new window will open as shown in the below image. Enter Basic Information of the Insured like, Name, Email ID, Mobile Number. Fill the required blocks with relevant data, as shown in the above image. The insured can calculate the premium with the help of Bajaj Allianz Premium Calculator. After completion of the premium calculation Enter Quote and additional information. To make Bajaj Allianz Online payment enter payment information. Bajaj Allianz provides the online renewal option. By using this online renewal process, insured can renew the policy at any time and any place. Every policy offered by Bajaj Allianz General Insurance has a policy period of 1 year. If the insured want to extend the policy, then he can renew the policy every year by Bajaj Allianz Online renewal. Just by entering basic details and policy number you can renew the Bajaj Allianz Insurance policy through online at any time anywhere. First of all, Visit the Bajaj Allianz General Insurance company official website www.bajajallianz.com. The homepage will open. Now, Select Bajaj Allianz General Insurance Portal and click on visit site. On the top of the page, you can find the list of policies offered by the Bajaj Allianz, i.e., Motor, Health, Travel, Home Insurance. Click on Buy Now; a new policy will be open as shown in the below image. Select either ‘Renew Any Insurer’s Car Insurance Policy’ or ‘Renew Bajaj Allianz Car Insurance Policy’. The policyholder may calculate the premium with the help of Bajaj Allianz Premium Calculator. To renewal, the policy by Bajaj Allianz Online payment, enter the payment information.